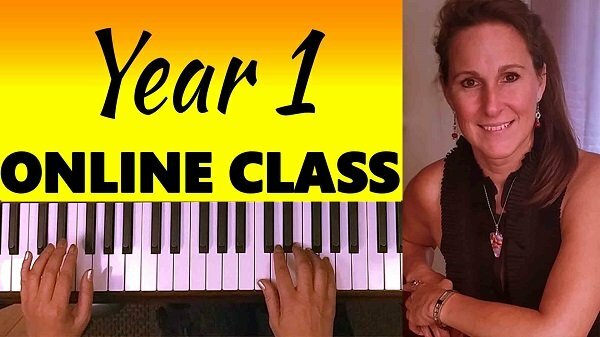 Make 2019 the year that you learn to play piano! Watch a video introduction to the class. and tailored to your exact learning needs! This unique learning experience allows you to interact with your teacher in real time, and have your specific learning needs met! It’s like having an in-person teacher, only with more access and flexibility! You will be motivated to keep up your piano studies like never before! Online Classes Offer Multiple Ways to Learn. It’s like PianoVideoLessons on steroids! January Classes – FULL/CLOSED – Add your name to the list for registration details about the next class. Use the free piano video lessons while you wait, Over 150 free piano lessons. Take me to the free piano video lessons! January session begins Jan 14, 2019 with live classes every second week, ending May 21, 2019. In each class you can participate in live, multi-camera lecture/demonstrations. All you have to do is click a link! Join the lesson with your phone/webcam if you wish so you can ask questions in real time! Don’t worry if you can’t make the live class. All classes will be recorded so that you don’t have to watch live to get full benefit from the program. I will address all of your concerns and needs during the live class, regardless of whether you can be there live. REPLAYS – until Dec 31, 2019. If you miss a lesson, no worries! All of the videos will be available for replay until Dec 31st, so you can go back and re-watch them as many times as you need to! CURRICULUM: Year 1, Units 1-5 plus bonus supplementary songs to learn! Curriculum delivered to your email inbox with practice instructions and videos. Personalized support for you in the live in bi-weekly Google Hangouts. Experience Lisa’s teaching just as you would in her private piano teaching studio. Each step of the way, the class will be tailored to your specific needs. Extra pieces of music will be taught to enhance and complement your learning. The main course ebook is purchased separately, you will receive a coupon code to purchase them at 50% off after you register. All supplementary music taught during the course will be provided free of charge. You’ll interact with other students. Share your own practice videos. – this means you’ll receive personalized feedback during the live lessons with tips to supercharge your learning! Have direct access to Lisa via this group Monday- Friday during the class term. We’ll have challenges and prizes! You’ll won’t believe how much you’ll learn by participating in this group! Are you ready to take your piano learning to the next level? Let’s do it!! No thanks, I’d rather work on my own. INVESTMENT – Give yourself the gift of music! All classes will be recorded. You’ll be able to watch the replays for a full year. Plus, you can get help and support via our Private Facebook for the 5 month duration of the class. Lots of opportunity for personalized learning and interaction, even if you miss the live class! Beginners who want to make learning to play piano a priority in 2019, learning together in a highly motivating environment with personalized help from the teacher in a supportive group environment. Access to lesson replays for a full year. Private Facebook Group where you can share videos and camaradiue. PLUS: Ask the teacher questions during the 5 months of the class. Mon-Fri.